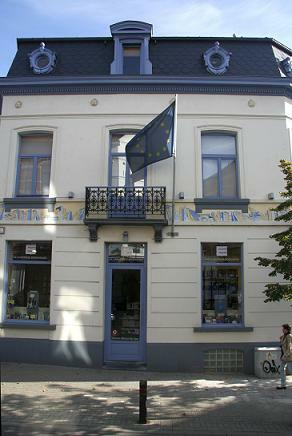 Cristina said: "This bookshop was founded in 1966 and spent most of its life in the building that used to house the translation service of the European Commission, in the very heart of the European quarter in Brussels, until the building itself was partially demolished and all its occupants had to find a home elsewhere. Nowadays the European Bookshop is to be found on a quiet street not very far from the Commission headquarters, and the move has allowed it to have more space at its disposal in the form of a downstairs section. As the name implies, it specializes in European Union affairs, and its main attraction is, of course, its uniquely large stock of books dealing with European integration: everything from the most theoretical aspects, such as the history, politics and economics of the EU, to the more mundane, such as the dozens of handbooks on CVs and multiple-choice tests for use by candidates taking part in EU job competitions. Most of the books are either in English or in French, with a sprinkling of other languages. (The range of English-language fiction, on the other hand, is poor - no more than a shelf full of airport novels). The downstairs department is good for dictionaries, conversation manuals and language courses, covering all EU languages and a few others as well. There is also a choice of travel guides, mainly in French." 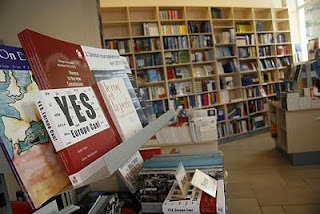 A very specific bookshop indeed is the EU Bookshop, with such a long history and a stock of over 3000 titles ranging from categories such as EU Concours, Law, Politics, Lobbying, Human Rights, etc. All European Union languages reside here, mostly in forms of dictionaries, grammar books and teaching materials. It is a natural matter that a bookstore such as this one should supply various institutions within the Union and in the world. It is definitely a peculiar store in terms of its specialization but in the city such as Brussels it has found a perfect place for its existence and is a reference point to many people living and working in the 'capital of European Union'. Oh, and there is a free delivery within EU institutions. Back to the list of bookstores in Brussels.